BBC News - Will Bristol's Somali voice be heard in the election? Will Bristol's Somali voice be heard in the election? The Somali community is one of the largest refugee groups in Bristol, but how will its voice be heard in the coming General Election? Even though refugees can work and are often well integrated in the city with their families, they cannot vote. Instead, many of the estimated 30,000 Somalis living in the city rely on community media to be heard. 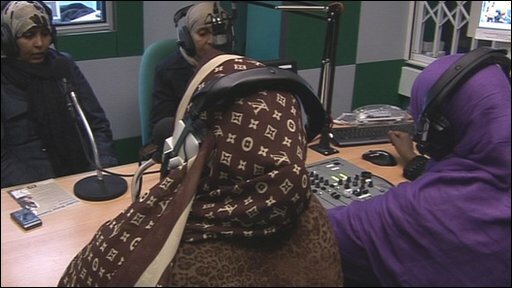 Bristol Community FM, for example, hosts a weekly chat show hosted by Somali Women's Voice. Muna Muhamud, who co-hosts the show, said there was a "sense of frustration" at the sheer number of Somalis who would not be able to vote on 6 May. But she was more worked up about British Somalis who can, but will not, vote. "What is more frustrating is the people who are British and not voting. A Somali British voting will get a voice for Somali refugees or Somali Europeans," she said. The Editor of the Somali Voice, Kayse Maxamed, said a lot of British Somalis just do not understand the process. "Many of them don't know how to register. They don't understand if you're not registered, on the list, you cannot vote," he said. "They think they will wake up on that election day and they will vote. But nevertheless, there are many Somalis who are willing and waiting to vote." Mr Maxamed arrived in the UK when Tony Blair's government was first elected in 1997 and is only about to vote in his first General Election. It has taken this long to get British citizenship - and an official voice in UK elections. He has joined the 92% of people living in Bristol who are entitled to vote, who are on the electoral register. It's the highest percentage on the register in years. Sagal Adan, from the Somali Women's Voice, encouraged people to use the privilege wisely. "Listeners are telling us it was very important for people to vote and that if they do they can make a difference. They were encouraging people not to be lazy."